This is where we're talking about all U.S. coins that can still be found in circulation -- and their values. 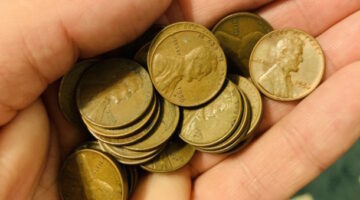 If you haven't checked your spare change recently for collectible coins that are rare & valuable... you should! See which pennies, nickels, dimes, half-dollars, and dollar coins you should be keeping and not spending -- because they're worth more than face value. Collecting coins from circulation (spare change, coin rolls from the bank, etc.) is a fun and budget-friendly way to build a coin collection! 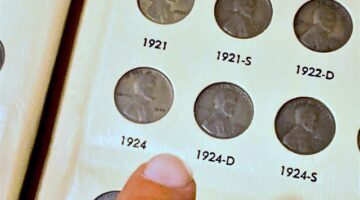 Scarce 2019-W Quarters Can Be Found In Circulation… If You Find One, It Could Be Worth Hundreds Of Dollars! 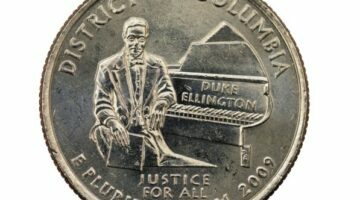 The US Mint released special 2019 quarters in circulation. 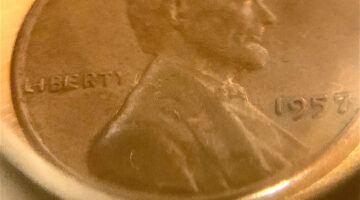 If you find a 2019-W quarter, it’s quite scarce… and valuable! See why these 2019-W quarters are so unique, plus how much they’re worth! 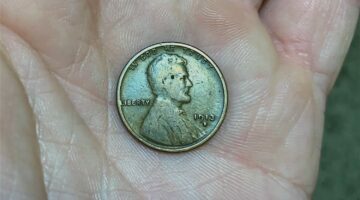 The 1999 Connecticut state quarter can be really valuable, especially if it’s a Connecticut quarter error! 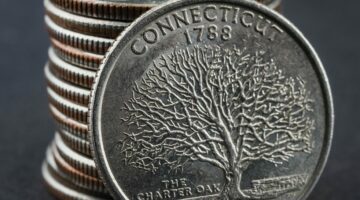 See how much your Connecticut quarters are worth. Have a coin with a flat, raised blob near the rim? It’s called a die cud error coin! Cuds on coins are really neat. 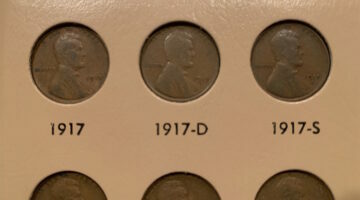 Here’s a helpful guide for collecting rare and valuable die cud error coins. How much is a 1999 New Jersey quarter worth? If it has errors, it’s worth thousands of dollars! 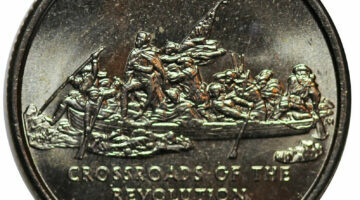 See the value of your New Jersey state quarter here. 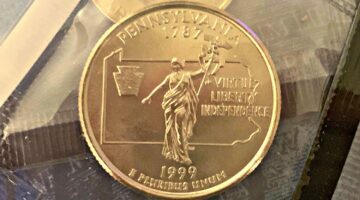 How much is a 1999 Pennsylvania quarter worth? If it has errors, it’s worth hundreds (or even thousands) of dollars! In this 1999 Pennsylvania State Quarter Guide, we’ll show you the value of your Pennsylvania quarter — whether it has errors or not. Repunched mint marks are error coins that are worth a lot of money. They would make a great addition to your coin collection. 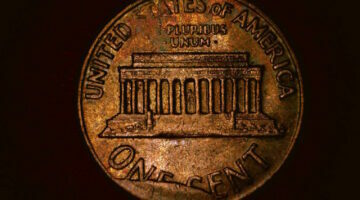 See how repunched mintmarks are different from doubled dies and. overmintmarks. And how much repunched mint marks are worth today. 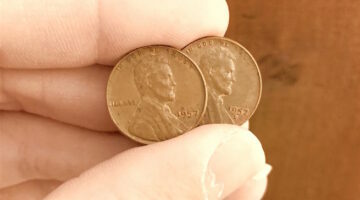 Are you looking for BIE Lincoln pennies in your loose change? You should be! 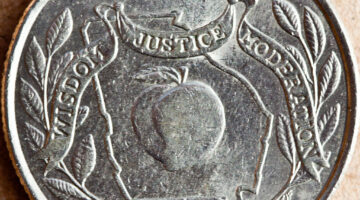 These scarce and valuable error coins can be found in circulation. Here’s what to look for, where you are most likely to find them, and how much they’re worth. Did you know there’s a 1999 Georgia quarter error worth $10,000?! That’s just ONE of 5 types of errors you should look for on your Georgia state quarters. We’ll help you determine if you have a Georgia error quarter, how much it’s worth, and how much regular Georgia quarters without errors are worth. 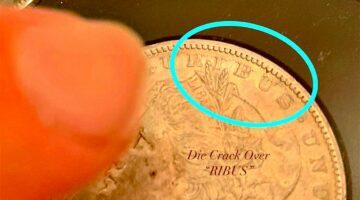 Die break coins are error coins. Some are rarer than others. Some are worth $100 or more. 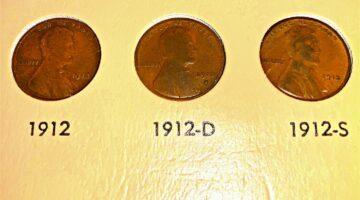 If you have a die crack coin, cud coin, or other types of die break error coins… here’s how to determine their value. 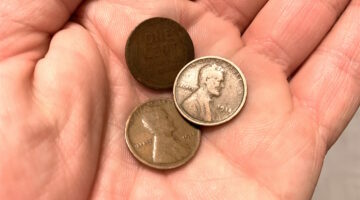 Off-center coins are rare… but not impossible to find! 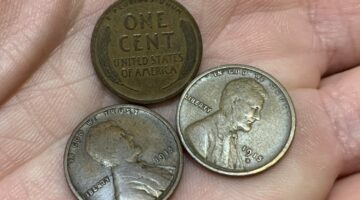 See photo examples of off-center error coins + The value of off-center coins, based on percent off-center. Have an Oregon state quarter? Some Oregon quarters have errors worth lots of money! 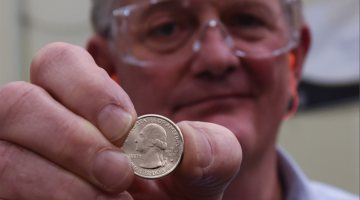 Here’s what to look for & how much Oregon state quarter errors are worth. If you have a 2008 Arizona quarter error coin, it could be worth $5… or more! 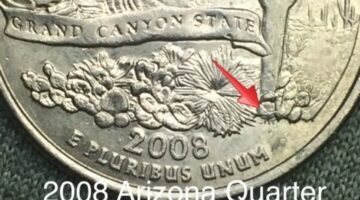 Some Arizona quarters have an extra cactus leaf, some were struck off-center, some have die chips (raised metal chunks on the coin’s surface), and some have a die crack running through the second “A” in ARIZONA. 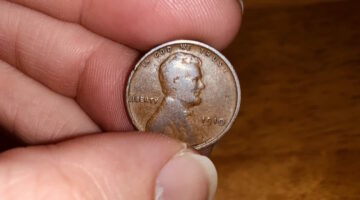 Here’s what to look for and how much these Arizona state quarter errors are worth.